I searched for some Transformer pieces and found a set that was Bumblebee and his sidekick-Bumble Bee stands about 5 inches high, so it was a perfect size. I also found Tranformer plates at the local party supply store that featured Bumblebee. I wound up making a box “funfetti” cake in the 9×13 size (it was just for family, so if you want to do this bigger, the double batch in the Wilton 11X14 pan would be perfect and feed about 20). Then I made my regular 2 lb of confectioners sugar batch of butter cream frosting (follow the recipe on the 1 lb box of Domino confectioner sugar instead of the Wilton butter cream–there is only butter, so it is much tastier). I split the white frosting into three different bowls and colored one red, one blue, and one yellow. I frosted half the cake in red, half in blue and then set the 7 inch plate in the middle of the top of the cake. Then I piped a border around the plate and around the base of the cake in the yellow. 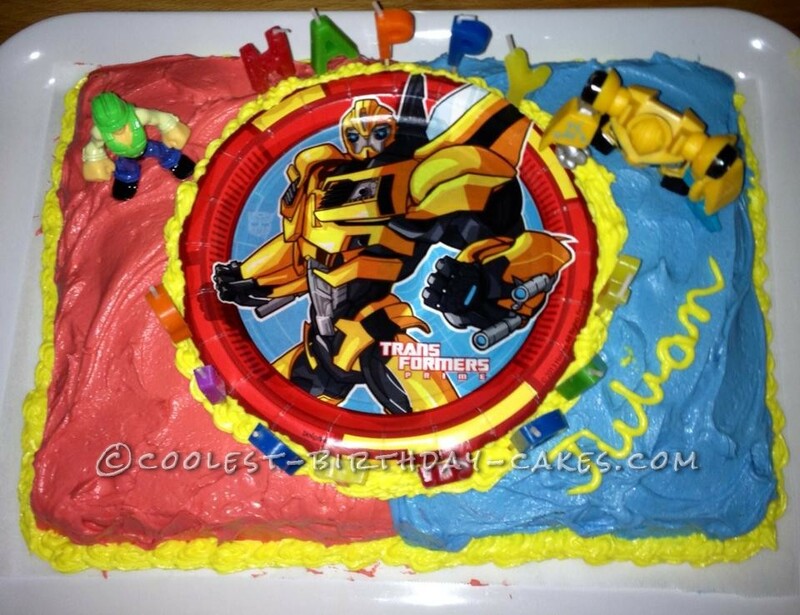 I had purchased Happy Birthday candles with which I surrounded the plate, placed my two Transformer pieces on top of the cake and wrote the child’s name in one corner–the picture doesn’t show it, but I also had a numeral candle that I used on the other corner. Tasted great, looked good and fulfilled the mission of being a Transformer themed cake.